On 1 October 2015, the Minister of Foreign Affairs of Liechtenstein, H.E. Ms. Aurelia Frick, convened a Ministerial-level Side-Event on the margins of the opening of the 70th Session of the UN General Assembly, entitled "Code of Conduct regarding Security Council Action against Genocide, Crimes against Humanity or War Crimes." The event aimed to help inform the member States and civil society of the progress of the ACT Group's initiative and to seek their observations, opinions and support. In addition to H.E. Ms. Aurelia Frick, Minister of Foreign Affairs of Liechtenstein, panelists included H.E. Mr. Carlos Raúl Morales, Minister of Foreign Affairs of Guatemala, H.E. Mr. Murray McCully, Minister of Foreign Affairs of New Zealand, and Dr. Kenneth Roth, Executive Director of Human Rights Watch. 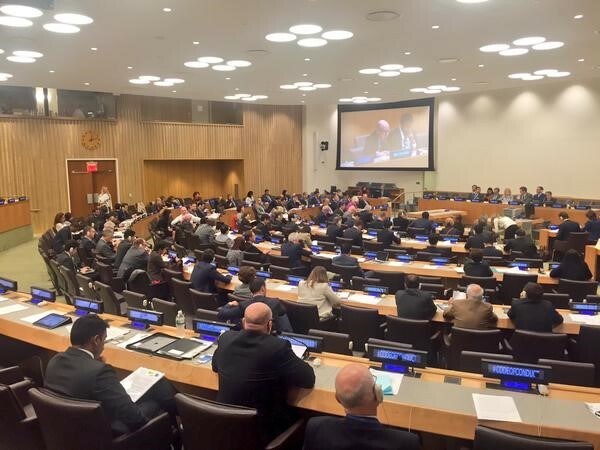 A total of 25 member States and 2 civil society organizations delivered statements at the event. Dr. Simon Adams, Executive Director of the Global Centre for the Responsibility to Protect, made a statement at the event.